APD is a chronic mental condition in which an individual's way of perceiving, thinking and relating to people are dysfunctional and negative. Such individuals don't have any regard for right and wrong and often disrespect the rights, wishes and feelings of others. It usually begins in childhood or in teenage and continues into adulthood. People with APD tend to lack empathy and are cynical and disdainful. They have an inflated and arrogant sense of self-appraisal and are extremely opinionated. - Genetics play an important role in APD. The inherited traits are aspects of an individual's personality passed on by parents, such as nervousness or having a positive attitude. - Environment includes the surroundings, events, relationships with family members and others. This also includes life situations such as type of parenting an individual has experienced whether loving or obnoxious. 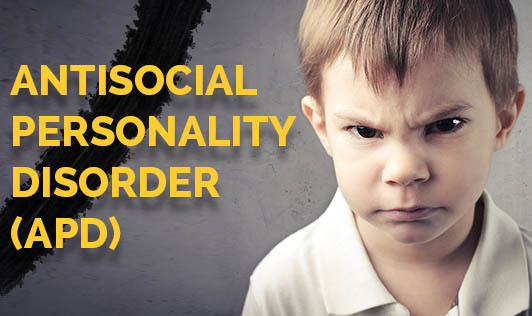 Few people may have genes that make them susceptible to developing antisocial personality disorder and life situations may elicit its development. Researchers suggest that there may be a link between a lack of empathy, accepting perspectives and problems of others, including other children in early life and later onset of antisocial personality disorder. APD symptoms may begin in childhood and become obvious in most people during their 20s and 30s. Whereas in children, hounding behaviour, malice to animals, social isolation, anger outbursts and poor performance in school may be in some cases, early signs of APD. A mental health professional will be able to teach you skills to learn how to set boundaries and help protect yourself from aggression and violence that are quite common to antisocial personality behaviour. If you or your child experiences signs and symptoms of APD, seek help from a mental health professional!